West Orange was originally part of the Native American Hackensack clan's territory, for over 10,000 years. The Hackensack were a phatry of the Unami tribe of the Leni Lenape. In their language, "Leni Lenape" means, "The Original People." The Acquackanonk sub-tribe were located along the Passaic River. They were part of the Algonquin language family, and known as "Delaware Indians" by the 18th century. They identified themselves with the totem of the Turtle. They were hunter-gatherers, matrilineal, and had cultural traditions such as Wedding Ceremonies. Northfield Ave and Old Indian Road in West Orange, remain as original Hackensack trails. Their main settlement was where the city of Hackensack is today. They would travel to the ocean or mountains to hunt for food. The Passaic River runs in an upside-down V shape - 8 miles (13 km) west and east, and 13 miles (21 km) north of West Orange. In the centuries prior to industrial development, the Passaic River and Watchung Mountains were major geographic landmarks amidst the untouched wilderness. West Orange is located at the peak of the Watchung Mountains. This vantage point over the valleys East to Manhattan - had a strategic value for Leni Lenape warriors, and later George Washington's troops during the American Revolution. The wooded South Mountain Reservation has rocks shaped like the backs of large Turtles. The area is now known as "Turtle Back Rock Picnic Area" and gives its name to the Turtle Back Zoo. The Turtle Back Rocks were considered sacred to the Native Americans, as related to their Creation myth of "Turtle Island". "Turtle Island" is the Native American name for North America. In the creation myth, the world was created from a turtle's back. The Native Americans originally did not understand the concept of "land ownership". They consisted of many hunter-gatherer tribes who would overlap territories and occasionally had tribal wars, but did not "own" land. They believed in taking only what was immediately necessary from nature, and considering the needs of the next seven generations. This hospitality at first benefited the European settlers, who struggled in the wilderness after reaching North America's shores. In the 1500s and 1600s, the territory was disputed and transferred many times between the Hackensack, Dutch, Scottish, Swedes, and English colonists. Due to the wars between the Native Americans and European settlers, most European settlers stayed East of the Hudson River. In 1664, the English took possession of Dutch New Netherland. On October 28, 1664, The English purchased 500,000 acres of land from the Hackensack, from Staten Island to the Passaic River on the North to the Raritan River on the South, for about 154 English pounds. This is known as the "Elizabethtown Purchase." In 1666, Puritan Captain Robert Treat moved south to New Jersey from Connecticut and purchased a tract of land from Governor Carteret, west of the Passaic River and 8 miles (13 km) east of what is currently West Orange. However, the Hackensack tribe disputed this purchase, and said it was not included in the Elizabethtown Purchase. On July 11, 1667, Treat settled the purchase through Samuel Efsal, a Lenni Lenape interpreter. He then founded "New Ark" or Newark, establishing it as a Puritan theocracy, as had been done in Milford, CT. The Newark territory kept extending West as the English overthrew the Dutch and claimed or purchased more Hackensack territory. This expansion was effected primarily by individual property owners, who would purchase tracts of land bit by bit. Sometimes they would name it after themselves or where they were from in Europe. Often the borders were not clearly defined, and few if any maps remain. In 1678, Anthony Olive became the first European to settle in what is now West Orange. He was of Dutch origin. He started a farm at the base of the mountains—in what is now Llewellyn Park. It was still untouched wilderness. In 1702, New Jersey became a royal colony of England. By 1706 what is now West Orange - was considered part of Essex County in the East Jersey territory. By the 1700s West Orange was known as part of the "Newark Mountains". During the American Revolution, the Valleys were populated by farms and mills. The area on Main St now known as "Tory Corner" was called Williamstown, after two brothers Nathaniel and Benjamin Williams. Nathaniel and his two eldest sons were Loyalists to the British crown, and gathered other Loyalists for meetings. Nathaniel took his eldest sons James and Amos to join the British Army in 1777, and never returned. Meanwhile, Nathaniel's wife Mary Williams stayed on the farm with her younger children. Her farm house had been built in 1720. She gave freely to Washington's revolutionary troops. James finally returned to the farm decades later, to reunite with his mother Mary. Nathaniel and Amos never returned. Nathaniel died of smallpox in New York. A plaque to Mary Williams was erected by the Daughters of the American Revolution in 1922. West Orange was initially a part of Newark township, and remained so until November 27, 1806, when the territory now encompassing all of The Oranges was detached to form Orange Township. On April 13, 1807, the first government was elected. On January 31, 1860, Orange was incorporated as a town, and on April 3, 1872, it was reincorporated as a city. Almost immediately, Orange began fragmenting into smaller communities, primarily because of local disputes about the costs of establishing paid police, fire and street departments. South Orange was organized on April 1, 1861, Fairmount (an independent municipality for less than one year that was later to become part of West Orange) on March 11, 1862, and East Orange on March 4, 1863. West Orange (including what had been the briefly independent municipality of Fairmount) was incorporated as a township on April 10, 1863, and was reformed as a town on February 28, 1900. In 1980, West Orange again became a township to take advantage of federal revenue sharing policies that allocated a greater share of government aid to municipalities classified as townships. The township derives its name from William III of England or William IV, Prince of Orange, which in turn is derived from the city of Orange. The Eagle Rock Reservation borders West Orange and Montclair. It was home to many eagles. It currently is the trail head for the Leni Lenape Trail. Rock Spring is located at the bottom of the Turtle Back Rocks - currently at the corner of Northfield Ave and Walker Road, West Orange. The water from this Spring was considered to have healing powers since Native American times. By the 19th century, visitors from New York City would come to West Orange to drink the water from this spring for its supposed curative powers. West Orange became a resort or country retreat - with boating, fishing, and an Amusement Park at Crystal Lake near Eagle Rock Reservation. In 1901, the first uphill Automobile test took place called the Eagle Rock Hill Climb. Llewellyn Park, the first planned community in America, is located within West Orange, and was designed by entrepreneur Llewellyn Haskell and architect Alexander Jackson Davis in 1857. Llewellyn Park is considered among the best examples of the "Romantic Landscape" movement of that period. Thomas Edison was one of the many residents. Thomas Edison's Laboratory, currently a National Park, invented 1093 patents including the Light Bulb, Stock Ticker, and Recorded Sound. The laboratory grounds also include the Black Maria - America's first movie studio, the birthplace of Hollywood. In the late 1800s, the Valley region of West Orange was home to 34 hat factories, known as the hat making capital of the country. It is currently under redevelopment as 'Hat City' or 'The Valley Arts District'. Until 2007, the Orange Quarry Company was located in West Orange, where basalt was mined. Post-World War II, there was a real estate development boom in West Orange. In the 1960s, "white flight" from the Newark Riots and Civil Rights Era led to further settlement of West Orange. The 1970 opening of I-280 highway made West Orange a popular "bedroom community" suburb for commuters to New York City. This coincided with the US immigration laws re-opening to Asian immigration in 1965, and 1980's desegregation of American suburbs. By the 1990s, West Orange had become the "melting pot" of America - home to a very diverse and international community. Many of the industries that had made West Orange grow, left the area by the 1960s. This left some urban blight and abandoned warehouses in the Valley, in contrast to wealthy communities on top of the mountains. It is currently home to Kessler Institute, where actor Christopher Reeve rehabilitated, and Daughters of Israel. It is also home to many Jewish synagogues and Korean churches. According to the United States Census Bureau, the township had a total area of 12.171 square miles (31.522 km2), including 12.046 square miles (31.198 km2) of land and 0.125 square miles (0.324 km2) of water (1.03%). It is located approximately 5 miles (8.0 km) west of downtown Newark and 13 miles (21 km) west of New York City. 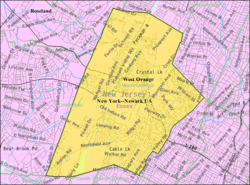 West Orange borders the Essex County communities of Essex Fells, Livingston, Millburn, Maplewood, Montclair, Orange, Roseland, Verona and South Orange. Unincorporated communities, localities and place names located partially or completely within the township include Crestmont, Crystal Lake, Llewellyn Park, Pleasantdale and Saint Cloud. Beyond the high ridge traced by Prospect Avenue, West Orange becomes a patchwork of post-World War II suburban neighborhoods, interspersed with pockets of older Victorian homes, as well as golf courses, professional campuses, and shopping centers. Pleasantdale, a walkable business district in this part of the township, includes a number of restaurants, office buildings, stores, and houses of worship. Pleasantdale is also home to a significant Orthodox Jewish community. As of the 2000 United States Census there were 44,943 people, 16,480 households, and 11,684 families residing in the township. The population density was 3,708.7 people per square mile (1,431.7/km2). There were 16,901 housing units at an average density of 1,394.7 per square mile (538.4/km2). The racial makeup of the township was 67.6% White, 17.5% African American, 0.14% Native American, 8.09% Asian, 0.04% Pacific Islander, 3.52% from other races, and 3.20% from two or more races. Hispanic or Latino of any race were 10.04% of the population. There were 16,480 households out of which 32.2% had children under the age of 18 living with them, 56.0% were married couples living together, 11.2% had a female householder with no husband present, and 29.1% were non-families. 24.6% of all households were made up of individuals and 11.6% had someone living alone who was 65 years of age or older. The average household size was 2.66 and the average family size was 3.19. In the township the population was spread out with 23.3% under the age of 18, 6.2% from 18 to 24, 29.7% from 25 to 44, 23.4% from 45 to 64, and 17.4% who were 65 years of age or older. The median age was 39 years. For every 100 females, there were 88.6 males. For every 100 females age 18 and over, there were 84.0 males. The median income for a household in the town was $69,254, and the median income for a family was $83,375. Males had a median income of $52,029 versus $39,484 for females. The per capita income for the township was $34,412. About 4.6% of families and 5.6% of the population were below the poverty line, including 6.0% of those under age 18 and 7.8% of those age 65 or over. As of the 2010 United States Census, there were 46,207 people, 16,790 households, and 11,753.000 families residing in the township. The population density was 3,836.0 per square mile (1,481.1/km2). There were 17,612 housing units at an average density of 1,462.1 per square mile (564.5/km2). The racial makeup of the township was 57.15% (26,406) White, 26.58% (12,284) Black or African American, 0.38% (174) Native American, 7.96% (3,680) Asian, 0.02% (10) Pacific Islander, 4.82% (2,227) from other races, and 3.09% (1,426) from two or more races. Hispanic or Latino of any race were 16.20% (7,487) of the population. There were 16,790 households out of which 33.4% had children under the age of 18 living with them, 53.1% were married couples living together, 12.7% had a female householder with no husband present, and 30.0% were non-families. 25.5% of all households were made up of individuals, and 12.6% had someone living alone who was 65 years of age or older. The average household size was 2.70 and the average family size was 3.28. In the township, the population was spread out with 23.7% under the age of 18, 7.1% from 18 to 24, 25.7% from 25 to 44, 27.6% from 45 to 64, and 15.9% who were 65 years of age or older. The median age was 40.6 years. For every 100 females there were 88.3 males. For every 100 females ages 18 and older there were 83.2 males. The Census Bureau's 2006-2010 American Community Survey showed that (in 2010 inflation-adjusted dollars) median household income was $88,917 (with a margin of error of +/- $4,480) and the median family income was $106,742 (+/- $5,256). Males had a median income of $65,854 (+/- $4,548) versus $43,223 (+/- $2,769) for females. The per capita income for the township was $43,368 (+/- $2,021). About 4.9% of families and 7.1% of the population were below the poverty line, including 8.5% of those under age 18 and 7.5% of those age 65 or over. Developed by Sol Atlas, Essex Green Shopping Center is an outdoor mall with stores, like ShopRite, restaurants and an AMC Theatres Fork and Screen dine-in movie theater. The 350,000-square-foot (33,000 m2) mall, the largest of its type in Essex County, was purchased in 2016 by Clarion Partners. The Jersey Rockhoppers hockey team of the Eastern Professional Hockey League, formed for the 2008-09 season, played home games at the Richard J. Codey Arena. The arena also used to be the practice facility for the New Jersey Devils from 1986 to 2007. The New Jersey Daredevils, a special needs hockey team formed in 2002 that plays in the SHI (Special Hockey International League), uses the arena for home games and practices. Annually in October, the Daredevils host a Halloween themed tournament for Special Hockey International teams (including the Daredevils themselves) called Frankenfest. Frankenfest has been going on every October since 2009. The New Jersey Devils Youth Hockey team also plays here as well. The township is set off by two large parks: the South Mountain Reservation along its southwestern borders with Maplewood, Millburn and South Orange, and the Eagle Rock Reservation along its northeastern borders with Montclair and Verona. The township straddles the transition between the low-lying Newark Bay basin and the high terrain of the Watchung Mountains.Fishing and kayaking is available on the Rahway River. West Orange is governed by Plan B of the Mayor-Council system of municipal government pursuant to the Faulkner Act, as implemented on July 1, 1962, by direct petition. Each member of the council is elected to a four-year term of on a staggered basis, with either three council seats or two seats and the mayoral seat up for election every even-numbered year. Township elections are nonpartisan, with all seats chosen on an at-large basis. In December 2013, the Township Council approved an ordinance that shifted municipal elections from May to the November general election, citing savings from the combined elections estimated as much as $100,000 per cycle. as of 2019[update], the Mayor of West Orange is Robert Parisi, whose term of office ends December 31, 2022. Members of the Township Council are Michelle Casalino (2020), Cindy Matute-Brown (2022), Jerry Guarino (2020), Joe Krakoviak (2020) and Susan McCartney (2022). In September 2015, the Township Council selected Michelle Casalino to fill the seat expiring in December 2016 that had been held by Patty Spango until her resignation from office. On November 8, 2016, Councilwoman Casalino was elected to a four-year term. As of March 23, 2011, there were a total of 30,561 registered voters in West Orange, of which 14,166 (46.4%) were registered as Democrats, 3,273 (10.7%) were registered as Republicans and 13,108 (42.9%) were registered as Unaffiliated. There were no voters registered to other parties. In the 2012 presidential election, Democrat Barack Obama received 71.3% of the vote (15,214 cast), ahead of Republican Mitt Romney with 27.9% (5,950 votes), and other candidates with 0.8% (177 votes), among the 21,491 ballots cast by the township's 32,061 registered voters (150 ballots were spoiled), for a turnout of 67.0%. In the 2008 presidential election, Democrat Barack Obama received 67.8% of the vote (15,423 cast), ahead of Republican John McCain with 29.3% (6,667 votes) and other candidates with 0.7% (154 votes), among the 22,740 ballots cast by the township's 30,260 registered voters, for a turnout of 75.1%. In the 2004 presidential election, Democrat John Kerry received 64.7% of the vote (13,535 ballots cast), outpolling Republican George W. Bush with 34.0% (7,118 votes) and other candidates with 0.7% (186 votes), among the 20,933 ballots cast by the township's 28,418 registered voters, for a turnout percentage of 73.7. In the 2013 gubernatorial election, Democrat Barbara Buono received 56.0% of the vote (6,350 cast), ahead of Republican Chris Christie with 42.9% (4,863 votes), and other candidates with 1.1% (125 votes), among the 11,580 ballots cast by the township's 32,390 registered voters (242 ballots were spoiled), for a turnout of 35.8%. In the 2009 gubernatorial election, Democrat Jon Corzine received 59.3% of the vote (8,168 ballots cast), ahead of Republican Chris Christie with 32.9% (4,530 votes), Independent Chris Daggett with 6.2% (858 votes) and other candidates with 0.7% (100 votes), among the 13,773 ballots cast by the township's 29,898 registered voters, yielding a 46.1% turnout. The West Orange Public Schools serves students in pre-kindergarten through twelfth grade. As of the 2015-16 school year, the district's 12 schools had an enrollment of 6,867 students and 626.5 classroom teachers (on an FTE basis), for a student–teacher ratio of 10.9:1. Schools in the district (with 2015-16 enrollment data from the National Center for Education Statistics) are Betty Maddalena Early Learning Center (PreK), Gregory Elementary School (521 students; in grades K-5), Hazel Avenue Elementary School (366; K-5), Kelly Elementary School (420; PreK-5), Mount Pleasant Elementary School (380; K-5), Redwood Elementary School (546; K-5), St. Cloud Elementary School (388; K-5), Washington Elementary School (434; K-5), Thomas A. Edison Middle School (517; 6), Liberty Middle School (497; 7&8), Roosevelt Middle School (585; 7&8) and West Orange High School (2,084) for grades 9-12. Pleasantdale School was renamed Kelly School in May 2016 in honor of Mark and Scott Kelly, identical twins who attended the school starting in second grade before becoming NASA astronauts. As of May 2010[update], the township had a total of 114.54 miles (184.33 km) of roadways, of which 89.63 miles (144.25 km) were maintained by the municipality, 19.45 miles (31.30 km) by Essex County and 5.46 miles (8.79 km) by the New Jersey Department of Transportation. The Essex Freeway (Interstate 280) is the main limited access road that passes through from east to west. Route 10 passes through in the western area and has its western terminus at CR 577 (which runs north-south through the township). CR 508 also traverse the municipality from east to west. NJ Transit offers bus service in the township to Newark on the 21, 29, 71, 73 and 79 routes, with local service on the 97 route. In September 2012, as part of budget cuts, NJ Transit suspended service to Newark on the 75 line. DeCamp Bus Lines offers scheduled service between the township and the Port Authority Bus Terminal in Midtown Manhattan on the 66 route. Coach USA / Community Coach serves the Port Authority Bus Terminal on route 77. OurBus operates a commuter route to New York City serving Livingston and West Orange. The township offers a jitney service that operates on weekdays, offering service to the Orange and South Orange train stations. For many decades West Orange has been a hotbed for the mass-media and telecommunication industries. Thomas Edison's Black Maria, the first movie studio ever, was located on Main Street and Lakeside Avenue. Several radio and television broadcast antennas are located in the town. From the late 1960s/early-1970s until the early 1990s UHF Channel 68 TV maintained their offices, studios and transmitter at 416 Eagle Rock Avenue. After Channel 68 moved to West Market Street in Newark and their transmitter to the Empire State Building in Manhattan, NBC owned and operated stations WNBC-TV Channel 4 and WPXN-TV Channel 31 (NBC later sold its interest in WPXN's parent Paxson Communications) moved into the Eagle Rock Avenue complex operating backup transmitter facilities in case of a catastrophic event such as the destruction of their main transmitters at the World Trade Center which occurred on September 11, 2001. The original Channel 68 building was later demolished and a new building was erected in its place. Two religious radio stations and one independent television station all owned by Family Stations, Inc. WFME (AM) on 1560 kHz and licensed to New York City, WFME-FM on 106.3mHz and licensed to Mount Kisco, New York and ethnic television station WNYJ-TV Channel 66 licensed to West Milford, New Jersey maintains their studios and offices on Mount Pleasant Avenue. WFME's former 94.7mHz frequency which was acquired by Cumulus Media in 2012 and renamed WNSH along with the former Upsala College radio station WFMU (now owned by Auricle Communications) have their transmitter towers on Marcella Avenue, WNSH's next to WFME/WNYJ and WFMU's in a fenced shack. Verizon Communications, going as far back as the mid to late 1950s and early 1960s when it was New Jersey Bell, operated an analog central office and later fiber optics facilities on Prospect Avenue near the Essex Green Shopping Center and a fiber optics and satellite transmitter facility which was originally owned and operated by MCI Inc. until it was acquired by Verizon in 2006. Additionally Sprint Corporation, T-Mobile and Verizon Wireless all own or lease cell phone towers throughout the town. See also: Category:People from West Orange, New Jersey. Nat Adderley Jr. (born 1955), music arranger who spent much of his career with Luther Vandross. Treena Livingston Arinzeh, biomedical engineer and professor known for her work researching adult stem-cell therapy. Mike Austin (born 1943), swimmer who represented the United States at the 1964 Summer Olympics in Tokyo and won a gold medal in the 4 × 100 m freestyle relay. Ben Barres (1954-2017), born as Barbara Barres, American neuroscientist at Stanford University and an outspoken advocate for underrepresented groups in science, including women, members of the LGBT community, and people of color. Ronald Bell (born 1951), musician with Kool & the Gang. John L. Blake (1831-1899), politician who represented New Jersey's 6th congressional district from 1879 to 1881. Enea Bossi Sr. (1888-1963), aviation pioneer who created the first stainless steel aircraft and one of the first human-powered planes. Martin Brodeur (born 1972), ice hockey goaltender in the NHL with the New Jersey Devils. Anna Easter Brown (1879-1957), part of the original nine group of founders in the Alpha Kappa Alpha sorority. Brendan Byrne (1924-2018), Governor of New Jersey from 1974 to 1982. Jean Byrne (1926-2015), educator who served as the First Lady of New Jersey from 1974 to 1982 during the tenure of her former husband, term-term Governor Brendan Byrne. David Cassidy (1950-2017), teen idol, singer and actor who appeared on the 1970s TV series The Partridge Family. Joan Caulfield (1922-1991), movie, theatre, television actress of the 1940s, 1950s, and 1960s who was born in East Orange, moved to West Orange during childhood and lived here until her high school graduation from a private school in Orange. James Ormsbee Chapin (1887-1975), artist. Mary Jo Codey (born 1955), healthcare activist and former First Lady of New Jersey. Jemima Condict (1754-1779), American Revolutionary War era diarist. Brandon Costner (born 1987), professional basketball forward for Caciques de Humacao of the Baloncesto Superior Nacional. Anthony Criss (born 1970), member of the rap group Naughty by Nature. Charles Cullen (born 1960), former nurse and serial killer who confessed to killing 40 people. Alexander Jackson Davis (1803-1892), architect who helped create Llewellyn Park. John J. Degnan (born 1944), Attorney General of New Jersey from 1978 until 1981 who was chosen as chairman of the Port Authority of New York and New Jersey. Frank J. Dodd (1938-2010), politician who served as president of the New Jersey Senate from 1974 to 1975. Joe Dooley (born 1966), head men's basketball coach of the East Carolina University Pirates. Billy Drummond (born 1959), jazz drummer. Ginny Duenkel (born 1947), winner of a Gold and Bronze medal in two swimming events at the 1964 Summer Olympics in Tokyo, Japan. Ginny Duenkel Municipal Pool is named in her honor. Charles Edison (1890-1969), United States Secretary of the Navy 1940, Governor of New Jersey 1941 to 1944 and son of Thomas Edison. Theodore Miller Edison (1898-1992), only child of his inventor father who graduated from college; went on to become an inventor with over 80 patents. Thomas Alva Edison (1847-1931), inventor of the phonograph, the incandescent electric lightbulb, and the first practical motion picture camera whose home was Glenmont Mansion. Edison's Black Maria, the first movie studio, was located in West Orange. Marion Eppley (1883-1960), physical chemist. Michael W. Farrell (born 1938), Senior Judge of the District of Columbia Court of Appeals. Eugenio Fernandi (1922–1991), tenor with the Metropolitan Opera who rose to prominence in the late 1950s and 1960s, receiving 22 curtain calls for his performance in Lucia di Lammermoor. Leo Fitzpatrick (born 1978), actor. Alisa Flatow (1975-1995), victim of the Egged bus 36 bombing. Alan Flusser (born 1945), men's clothing designer. Rich Galen (born 1946), columnist, political strategist and former press-secretary to Vice President Dan Quayle and Speaker of the House Newt Gingrich. Chris Gethard (born 1980), comedian, TV show host of The Chris Gethard Show, author of Weird New York and an associate editor of the Weird NJ publications. John J. Giblin (1909-1975), labor leader and Democratic Party politician who served one term in the New Jersey Senate. Whoopi Goldberg (born 1955), comedian, actress, talk show host. Maclyn Goldman (1901–1977), politician who served in the New Jersey Senate. Raymond E. Goldstein, (born 1961), Professor of Complex Physical Systems at the University of Cambridge. Allan Gorman (born 1947), visual art professional best known for his photorealistic paintings of industrial objects. Eldridge Hawkins Jr. (born 1979), former Mayor of Orange, New Jersey. Maya Hayes (born 1992), soccer player who has played for Sky Blue FC of the National Women's Soccer League. Will Hill (born 1990), safety for the Baltimore Ravens. Kyrie Irving (born 1992), professional basketball player for the Boston Celtics of the National Basketball Association. Mark Kelly (born 1964), NASA astronaut and husband of Congresswoman Gabrielle Giffords. Scott Kelly (born 1964), NASA astronaut. Gus Keriazakos (1931-1996), former MLB pitcher. Paul J. Kern (born 1945), commanding general of the United States Army Materiel Command from 2001 to 2004. Carole King (born 1942) and Gerry Goffin (born 1939), husband & wife songwriting team who resided off Pleasant Valley Way in the mid-1960s along with other songwriters, a location that gave rise to the song Pleasant Valley Sunday, recorded by the Monkees in 1967. Bettye LaVette (born 1946), soul singer who released her first record at age 16 and found success with I've Got My Own Hell to Raise at age 59 in 2005. Georgia Mason (1910-2007), botanist and author. Nick Massi (1927-2000), bass singer and bass guitarist for the Four Seasons. Joshua D. Maurer (born 1964), film producer, writer and actor whose credits include Georgia O'Keeffe, The Hoax, The Last Tycoon, Rosemary's Baby, Jodi Arias: Dirty Little Secret and Introducing Dorothy Dandridge. George B. McClellan (1826-1885), Major General and briefly general-in-chief of the Union Army during the Civil War who ran as a Democrat against Lincoln in the presidential election of 1864 and went on to become Governor of New Jersey (1878–1881). John F. McKeon (born 1958), member of the New Jersey General Assembly representing the 27th Legislative District who served as Mayor of West Orange from 1998 to 2010. Joseph Minish (1916-2007), represented New Jersey's 11th congressional district in the United States House of Representatives. Ken Murray (1928-2008), professional basketball player. Gordon Allen Newkirk Jr. (1928-1985), astrophysicist who studied the solar corona. Charles W. Nichols (1875–1959), businessman who constructed the Pleasantdale Chateau. Okieriete Onaodowan (born 1987), actor who originated the roles of Hercules Mulligan and James Madison in the 2015 Broadway musical Hamilton. Michael Oren (born 1955), Israeli ambassador to the United States. Fred Ott (1860-1936), an employee of Thomas Edison's in the 1890s who "starred" in two of the earliest surviving motion pictures – Edison Kinetoscopic Record of a Sneeze (a.k.a. Fred Ott's Sneeze) and Fred Ott Holding a Bird – both filmed in 1894. Robert Pearlman (born 1976), founder and editor of collectSPACE. Michael Pitt (born 1981), actor who was in Murder by Numbers, Hedwig and the Angry Inch, and Last Days, as well as HBO's Boardwalk Empire. Vinnie Politan (born 1965), co-anchor of In Session on the cable network truTV. Ann Probert (born 1938), golfer. Paul C. Reilly (1890-1984), architect who designed many buildings for Catholic clients and for several Manhattan theatres. John Renna (1920-1998), politician who served as Commissioner of the New Jersey Department of Community Affairs. Phil Rizzuto (1917-2007), nicknamed "The Scooter," played shortstop for the New York Yankees from 1941 to 1956. Douglas Robinson Jr. (1855-1918), businessman who was married to Corinne Roosevelt Robinson, the sister of U.S. President Theodore Roosevelt and the aunt of First Lady Eleanor Roosevelt. Douglas Robinson Sr. (1824-1893), businessman and banker. Vin Rock (born 1970), rapper for group Naughty by Nature. Peter W. Rodino (1909-2005), United States Congressman from 1949 to 1989. Hilary Rosen (born 1958), former chairman and CEO of the Recording Industry Association of America and CNN political analyst. Renee Rosnes (born 1962), jazz pianist. Sherry Ross (born c. 1954), sportscaster and journalist. Johnny Sansone (born 1957), electric blues singer, songwriter, harmonicist, accordionist, guitarist and piano player. Lyndsey Scott (born 1984), model, iOS mobile app software developer and actress. Carol Selman, historian, writer and teacher who has served on the New Jersey Historical Commission. Walter H. Seward (1896-2008), super-centenarian, lived to 111 years. Edward S. Shapiro (born 1938), historian of American history and American Jewish history who is a retired professor from Seton Hall University. Marc B. Shapiro (born 1966), professor and author of various books and articles on Jewish history, philosophy, and theology. Eve Slater (born 1945), physician who served as the United States Assistant Secretary for Health and Human Services under President George W. Bush, from 2002 to 2003. Amos Alonzo Stagg (1862-1965), known as "The Grand Old Man" of college football. During the founding year of the College Football Hall of Fame, he was inducted as both a player and a coach. He was among the first group of inductees into the Basketball Hall of Fame in 1959. He is also credited with the invention of the batting cage in baseball and the tackling dummy in football. West Orange's Stagg Field playground is named in his honor. Ranked #4 on the Sports Illustrated list of The 50 Greatest New Jersey Sports Figures. Andy Stern (born 1950), former president of the Service Employees International Union. Edwin Stern (born 1941), lawyer and judge who served as acting justice on the New Jersey Supreme Court. Mike Trainor (born 1981), comedian. Alberto Vilar (born 1940), former investment manager. Stephen Vittoria (born 1957), filmmaker and author. Evelyn Ward (born 1923), actress, mother of David Cassidy. Charlotte Fowler Wells (1814-1901), phrenologist and publisher. DJ Whoo Kid (born 1972), official DJ of G-Unit. Kenneth T. Wilson (born 1936) politician who served in the New Jersey General Assembly from 1968 to 1972. Scott Wolf (born 1968), actor who is best known as Bailey Salinger on the TV series Party of Five. Ian Ziering (born 1964), actor who is best known for the role of Steve Sanders on the TV series Beverly Hills, 90210. Abner Zwillman (1899-1959), mobster found hanging dead at his home at 50 Beverly Road. ^ Kuperinsky, Amy. "'The Jewel of the Meadowlands'? : N.J.'s best, worst and weirdest town slogans", NJ Advance Media for NJ.com, January 22, 2015. Accessed July 12, 2016. "Edison's town seal is marked with 'Let There Be Light,' and its welcome signs say 'Birthplace of Recorded Sound', thanks to Thomas A. Edison's tinkering in Menlo Park, the same reason why a newer slogan for Essex County's West Orange — Edison later lived there — is 'Where Invention Lives'." ^ a b Mayor's Office, Township of West Orange. Accessed November 5, 2018. ^ 2018 New Jersey Mayors Directory, New Jersey Department of Community Affairs. Accessed November 5, 2018. ^ Administration Administration, Township of West Orange. Accessed July 4, 2016. ^ Township Clerk, Township of West Orange. Accessed July 4, 2016. ^ U.S. Geological Survey Geographic Names Information System: Township of West Orange, Geographic Names Information System. Accessed March 14, 2013. ^ a b c d e f DP-1 - Profile of General Population and Housing Characteristics: 2010 Demographic Profile Data for West Orange township, Essex County, New Jersey, United States Census Bureau. Accessed May 23, 2012. ^ a b c Table DP-1. Profile of General Demographic Characteristics: 2010 for West Orange township, New Jersey Department of Labor and Workforce Development. Accessed May 23, 2012. ^ Census 2010: Essex County, Asbury Park Press. Accessed June 15, 2011. ^ Look Up a ZIP Code for West Orange, NJ, United States Postal Service. Accessed May 23, 2012. ^ Area Code Lookup - NPA NXX for West Orange, NJ, Area-Codes.com. Accessed October 3, 2013. ^ A Cure for the Common Codes: New Jersey, Missouri Census Data Center. Accessed May 23, 2012. ^ Haddon, Heather. "Brendan Byrne, 90 Years Old and Still in the Mix; New Jersey's Oldest-Living Governor Makes the Rounds with a New Biography", The Wall Street Journal, December 19, 2014. Accessed March 28, 2016. "Mr. Bryne hails from the Irish-American Democratic establishment that was once a driving force of New Jersey politics. His father, Francis, spent 50 years in local politics in West Orange, a suburb 20 miles from New York City." ^ Jacobs, Andrew. "Back From the Abyss", The New York Times, March 1, 2001. Accessed March 28, 2016. "It was 1997 and despite the region's revved-up economy, West Orange looked as if it were sliding into the abyss. Perched at the edge of New Jersey's most distressed urban places, this classic postwar suburb of 45,000 people faced a welter of seemingly intractable problems." ^ Table 7. Population for the Counties and Municipalities in New Jersey: 1990, 2000 and 2010, New Jersey Department of Labor and Workforce Development, February 2011. Accessed July 12, 2012. ^ a b c d Snyder, John P. The Story of New Jersey's Civil Boundaries: 1606-1968, Bureau of Geology and Topography; Trenton, New Jersey; 1969. p. 133. Accessed May 23, 2012. ^ Honeyman, Abraham Van Doren. Index-analysis of the Statutes of New Jersey, 1896-1909: Together with References to All Acts, and Parts of Acts, in the 'General Statutes' and Pamphlet Laws Expressly Repealed: and the Statutory Crimes of New Jersey During the Same Period, p. 314. New Jersey Law Journal Publishing Company, 1910. Accessed October 25, 2015. ^ "Removing Tiering From The Revenue Sharing Formula Would Eliminate Payment Inequities To Local Governments", Government Accountability Office, April 15, 1982. Accessed September 24, 2015. "On November 4, 1980, the communities of West Orange and Montclair voted a change to their township classification beginning in entitlement period 13 (Oct. 1, 1981, to Sept. 30, 1982). The communities of Belleville, Bloomfield, Nutley, Essex Fells, Verona, Caldwell, and West Caldwell have since become townships." ^ Narvaez, Alfonso A. "New Jersey Journal", The New York Times, December 27, 1981. Accessed September 24, 2015. "Under the Federal system, New Jersey's portion of the revenuesharing funds is disbursed among the 21 counties to create three 'money pools.' One is for county governments, one for 'places' and a third for townships. By making the change, a community can use the township advantage to get away from the category containing areas with low per capita incomes." ^ Gannett, Henry. The Origin of Certain Place Names in the United States, p. 23. United States Government Printing Office, 1905. Accessed September 16, 2015. ^ LP Historical Society and Archives, Llewellyn Park. Accessed September 10, 2007. ^ Jackson, John Brinckerhoff; and Horowitz, Helen Lefkowitz. Landscape in Sight: Looking at America, p. 180. Yale University Press, 2000. ISBN 0-300-08074-3. Accessed July 11, 2011. ^ Rand, Ellen. "New Jersey Housing; A Haven of Anachronistic Calm", The New York Times, December 21, 1980. Accessed July 11, 2011. ^ About the Rahway River Watershed, Rahway River Watershed Association. Accessed November 27, 2016. "The Rahway River is approximately 24-mile long and consists of four distinct branches. The West Branch, begins in West Orange and flows south through South Mountain Reservation and directly through downtown Millburn." ^ Areas touching West Orange, MapIt. Accessed April 17, 2015. ^ Martin, Antoinette. "An Enclave Wonders if It Is Too Private", The New York Times, July 10, 2005. Accessed May 23, 2012. ^ Caldwell, Dave. "Harder to Get to, Easier to Pay For", The New York Times, December 12, 2008. Accessed July 11, 2011. ^ Raum, John O. The History of New Jersey: From Its Earliest Settlement to the Present Time, Volume 1, p. 246, J. E. Potter and company, 1877. Accessed July 23, 2013. "West Orange was formed from the town of Orange; population in 1870, 2,106." ^ Staff. A compendium of the ninth census, 1870, p. 259. United States Census Bureau, 1872. Accessed July 23, 2013. ^ Porter, Robert Percival. Preliminary Results as Contained in the Eleventh Census Bulletins: Volume III - 51 to 75, p. 98. United States Census Bureau, 1890. Accessed July 23, 2013. ^ Thirteenth Census of the United States, 1910: Population by Counties and Minor Civil Divisions, 1910, 1900, 1890, United States Census Bureau, p. 336. Accessed May 22, 2012. 1890 population for West Orange Township is listed in Footnote 11. ^ Fifteenth Census of the United States : 1930 - Population Volume I, United States Census Bureau, p. 712. Accessed May 22, 2012. ^ a b c d Census 2000 Profiles of Demographic / Social / Economic / Housing Characteristics for West Orange township, Essex County, New Jersey, United States Census Bureau. Accessed May 23, 2012. ^ a b c d DP-1: Profile of General Demographic Characteristics: 2000 - Census 2000 Summary File 1 (SF 1) 100-Percent Data for West Orange township, Essex County, New Jersey, United States Census Bureau. Accessed July 10, 2012. ^ DP03: Selected Economic Characteristics from the 2006-2010 American Community Survey 5-Year Estimates for West Orange township, Essex County, New Jersey, United States Census Bureau. Accessed May 23, 2012. ^ Home Page, Essex Green. Accessed October 30, 2014. ^ "Clarion Partners Acquires Essex Green in New Jersey", Shopping Center Business, March 8, 2016. Accessed January 10, 2017. "Clarion Partners has acquired Essex Green, a six-building, 350,000-square-foot shopping center located in West Orange, free and clear of existing debt. Essex Green shopping center is the largest community shopping center in Essex County." ^ Stephenson, Colin. "Jersey Rockhoppers ready to drop puck", The Star-Ledger, October 30, 2008. Accessed October 3, 2013. "But the Eastern Professional Hockey League is nevertheless set to debut this weekend in four markets in the Greater New York area, with one of the league's teams based in northern New Jersey. The Jersey Rockhoppers, who will play their home games at the Richard J. Codey Arena in West Orange, are set to open up at 7:30 p.m. Saturday with a home game against the Brooklyn Aces." ^ South Mountain Reservation, Essex County, New Jersey Department of Parks, Recreation, and Cultural Affairs. Accessed May 23, 2012. ^ Eagle Rock Reservation, Essex County, New Jersey Department of Parks, Recreation, and Cultural Affairs. Accessed May 23, 2012. ^ "The Faulkner Act: New Jersey's Optional Municipal Charter Law" Archived October 12, 2013, at the Wayback Machine, New Jersey State League of Municipalities, July 2007. Accessed October 3, 2013. ^ Stevens, Melinda. "Township Council Approves Ordinance to Move Elections to November; The council approved the ordinance on Dec. 3 with a majority vote of 4-1. ", West Orange Patch, December 7, 2013. Accessed October 30, 2014. "The Township Council voted to approve Ordinance No. 2392-13, which will move nonpartisan municipal elections from May to November, at the Dec. 3 township council meeting.... Mayor Robert Parisi initiated the change last month and recommended the election be moved for various reasons, including trying to save the taxpayers money and keeping the residents and students of the West Orange School District safe." ^ Township Council, Township of West Orange. Accessed November 5, 2018. ^ 2018 Municipal Data Sheet, Township of West Orange. Accessed November 5, 2018. ^ Essex County Directory, Essex County, New Jersey. Accessed November 5, 2018. ^ Harewood, Chris. "Michelle Casalino is Appointed as Next Councilwoman", Tap Into West Orange, September 26, 2015. Accessed July 4, 2016. "In Tuesday's special West Orange Town Council meeting, Board of Education member Michelle Casalino was appointed to fill the position left behind by resigned Councilwoman Patty Spango. " ^ 2014 Current Fund Budget Detail, Township of West Orange. Accessed October 30, 2014. ^ New Jersey Congressional Districts 2012-2012: West Orange, New Jersey Redistricting Commission, December 23, 2011. Accessed January 6, 2013. ^ District information for West Orange School District, National Center for Education Statistics. Accessed November 1, 2018. ^ School Data for the West Orange Public Schools, National Center for Education Statistics. Accessed November 1, 2018. ^ Betty Maddalena Early Learning Center, West Orange Public Schools. Accessed November 1, 2018. ^ Gregory Elementary School, West Orange Public Schools. Accessed November 1, 2018. ^ Hazel Avenue Elementary School, West Orange Public Schools. Accessed November 1, 2018. ^ Kelly Elementary School, West Orange Public Schools. Accessed May 20, 2016. ^ Mount Pleasant Elementary School, West Orange Public Schools. Accessed November 1, 2018. ^ Redwood Elementary School, West Orange Public Schools. Accessed November 1, 2018. ^ St. Cloud Elementary School, West Orange Public Schools. Accessed November 1, 2018. ^ Washington Elementary School, West Orange Public Schools. Accessed November 1, 2018. ^ Thomas A. Edison Middle School, West Orange Public Schools. Accessed November 1, 2018. ^ Liberty Middle School, West Orange Public Schools. Accessed November 1, 2018. ^ Roosevelt Middle School, West Orange Public Schools. Accessed November 1, 2018. ^ West Orange High School, West Orange Public Schools. Accessed November 1, 2018. ^ Schools, West Orange Public Schools. Accessed November 1, 2018. ^ New Jersey School Directory for the West Orange Public Schools, New Jersey Department of Education. Accessed December 29, 2016. ^ Pearlman Robert Z. "Kelly Elementary: Astronaut Twins Honored with Grade School Renaming", Space.com, May 19, 2016. Accessed May 20, 2016. "Mark and Scott Kelly, who 44 years ago transferred into the second grade at Pleasantdale Elementary, returned to West Orange, New Jersey for the renaming of their alma mater. Kelly Elementary School was dedicated to the two hometown heroes during an outdoor ceremony held on the front lawn the school with city and school leaders, students and teachers." ^ Essex County Bus / Rail Connections, NJ Transit, backed up by the Internet Archive as of May 22, 2009. Accessed October 30, 2014. ^ Essex County System Map, NJ Transit. Accessed October 30, 2014. ^ Rouse, Karen. "N.J. Transit bus No. 75, running from Passaic County to Newark, will no longer operate", The Record (Bergen County), August 29, 2012. Accessed August 5, 2015. "Starting Saturday, the NJ Transit No. 75 bus — which runs from Butler through Pompton Lakes, Pequannock, Wayne and Little Falls on its way to Newark — will no longer operate as NJ Transit's plan to save $2.5 million in operating costs takes effect." ^ Route 66 Schedule, DeCamp Bus Lines. Accessed October 30, 2014. ^ Schedule Details West Orange, NJ to New York, NY, Coach USA. Accessed October 30, 2014. ^ "Livingston Commuter Options Make "Summer from Hell" Commute Easier". TAP into. July 27, 2017. Retrieved August 20, 2017. ^ Local Jitney/Shuttle, Township of West Orange. Accessed October 30, 2014. ^ Stewart, Zan. "Born to swing: Nat Adderley Jr. returns to his roots", The Star-Ledger, September 10, 2009. Accessed October 30, 2014. "These days, Adderley, who makes his home in West Orange, has his sights set back on jazz." ^ "Dr. Treena Livingston Arinzeh", The Rutgers African-American Alumni Alliance. September 1, 2006. Accessed January 1, 2018. "Dr. Arinzeh was born and raised in Cherry Hill, New Jersey to Marva Livingston and the late Andrew Livingston, Jr. She currently lives in West Orange, New Jersey where she is happily married to Uzo Arinzeh, Rutgers alumnus from class of 1990 and Wall Street executive, and has two children, Nneka and Quintin Arinzeh." ^ Elliott, Walter. "Essex County Olympians: Then and Now", LocalTalkNews.com, August 23, 2012. Accessed October 25, 2015. "West Orange: Mike Austin (b. 1943) Swimming, 1 GLD, 1964 SO"
^ Huberman, Andrew D. "Ben Barres (1954-2017)", Nature, January 2, 2018. Accessed February 16, 2018. "Barres was raised in West Orange, New Jersey"
^ McFaul, Lauren. "Kool's gang freshens rock with funk", The Spokesman-Review, June 3, 1985. Accessed October 25, 2015. "Ronald Bell has a studio in his West Orange, N.J., home and from there has worked on production for Kool & the Gang's last six albums." ^ The New Jersey Law Journal, Volume 22; Volume 1899, p. 348. Accessed June 28, 2018. "Mr. John L. Blake, of Llewellyn Park, West Orange, N. J., died October 10, after an illness of several months." ^ Staff. "Enea Bossi Is Dead at 74; Was Pioneer in Aviation", The New York Times, January 12, 1963. Accessed February 28, 2011. ^ Chere, Rich. "New Jersey Devils goalie Martin Brodeur honored by General Assembly and Senate", The Star-Ledger, June 18, 2009. Accessed January 29, 2011. "Brodeur, who lives in Codey's district in West Orange, pointed out that he may be a Canadian from Quebec but 'New Jersey is all I've known my whole adult life.'" ^ Founders: The Original Group, Alpha Kappa Alpha. Accessed October 30, 2014. "Anna Easter Brown - Born: Easter Sunday, April 13, 1879, West Orange, NJ"
^ Golway, Terry. "When Codey Talks, He Talks to Them", The New York Times, October 31, 2004. Accessed November 5, 2007. "Essex County, home of the state's largest city, Newark, and a diverse population of nearly 800,000, has not had a governor to call its own since Brendan T. Byrne - another native of West Orange - left office January 1982." ^ Shea, Kevin. "Former N.J. First Lady Jean Byrne dies at 88", NJ.com, August 11, 2015. Accessed October 25, 2015. "Born in Newark, Byrne spent her childhood in West Orange." ^ Boyd, Joseph G. "David Cassidy values happiness more than success", The Milwaukee Sentinel, August 19, 1981. Accessed January 17, 2011. ^ a b Allis, Tim. "The Boys Are Back", People (magazine), November 1, 1993. Accessed May 4, 2011. "David, by contrast, spent his earliest years as an only child in a row house in West Orange, N.J., with his mother, stage actress Evelyn Ward, who was divorced from Jack when David was 3." ^ Fowler, Glenn. "Joan Caulfield, A Film Actress, Is Dead at 69", The New York Times, June 20, 1991. Accessed May 23, 2012. "Miss Caulfield, who was a native of West Orange, N.J., attended Columbia University and was a fashion model and a cover girl before she landed ingenue roles on Broadway in the early 1940's." ^ James Ormsbee Chapin (1887 - 1975), AskArt. Accessed October 30, 2014. "James Chapin was born in West Orange, New York." ^ Beckerman, Jim. "Jazzman Bill Charlap takes over as Director of Jazz Studies at William Paterson", The Record (Bergen County), August 26, 2015. Accessed October 19, 2015. "'When you're playing solo piano, you're something like an orchestra,' says Charlap (pronounced 'Shar-lap'), a West Orange resident." ^ Mansnerus, Laura. "Choosing Her Fights, While She Can", The New York Times, January 29, 2005. Accessed June 28, 2018. "Mrs. Codey, 49, grew up in West Orange, where she and her husband now live with their sons, Kevin, 20, and Christopher, 16." ^ Fairleigh Dickinson University Commencement Honoree: Richard J. Codey, Fairleigh Dickinson University. Accessed December 31, 2006. ^ Manuscript Group 123, Jemima Condict (1754-1779), New Jersey Historical Society. Accessed January 17, 2011. ^ Young, Jim. "Strong Sendek Recruiting Class Adds N.J. Power Forward", Greensboro News & Record, September 24, 2004. Accessed November 5, 2007, "N.C. State landed its third commitment for the Class of 2005 when Brandon Costner, a 6-foot-8, 210-pound power forward from West Orange, N.J., picked the Wolfpack on Wednesday." ^ Biography, Cicely Cottingham. Accessed June 28, 2018. "Cicely Cottingham currently lives and works in West Orange, New Jersey." ^ a b Ross, Barbara. "'Naughty' Guys Are Arrested On Gun Charges", New York Daily News, June 14, 1997. Accessed January 29, 2011. "Two members of the Grammy-winning rap group Naughty by Nature were charged yesterday with carrying loaded and unlicensed 9-mm. pistols. Anthony (Treach) Criss, 26, and Vincent (Vinnie) Brown, 26, both of West Orange, N.J., were arraigned on felony charges of criminal possession of a weapon." ^ Hepp, Mark. "A killer's final insult", The Star-Ledger, March 3, 2006. Accessed October 30, 2014. "'Yes, I can,' said Cullen, a slightly built, 46-year-old West Orange native who did not look at the judge or the 21 people who addressed him as he sat at the defense table in Somerset County's Historic Courthouse." ^ Jailer, Mildred. "Preserving the Victorian Look", The New York Times, March 19, 1978. Accessed November 1, 2018. "Together with the Bloomfield Historical Society, the North Jersey group has purchased a tombstone for the previously unmarked grave of Alexander Jackson Davis, the noted Victorian who lived in Llewellyn Park in West Orange." ^ John J. Degnan, New Jersey Attorney General. Accessed October 30, 2014. "John J. Degnan was born on October 6, 1944 in West Orange, New Jersey." ^ Staff. "The Region; Frank Dodd in Race", The New York Times, February 4, 1981. Accessed October 30, 2014. "Senator Frank J. Dodd, Democrat of West Orange, became the fourth person to announce formally that he is seeking the Democratic nomination for governor." ^ Joe Dooley - 2014-15 Men's Basketball Coaching Staff - Florida Gulf Coast University, Florida Gulf Coast Eagles men's basketball. Accessed June 28, 2018. "A native of West Orange, N.J., Dooley was an outstanding prep player at St. Benedicts High School in New Jersey where he set a then-school record with 1,140 career points." ^ a b "The State of Jazz: Meet 40 More Jersey Greats", The Star-Ledger, September 28, 2003, backed up by the Internet Archive as of September 27, 2008. Accessed September 15, 2017. "Billy Drummond -- An exciting drummer who lives in West Orange with his wife, pianist Renee Rosnes, Drummond has performed and/or recorded with Rosnes, Sonny Rollins, Walt Weiskopf, Steve Kuhn, Carla Bley, Wallace Roney, the Drummonds and many others." ^ "Webster and Miss Duenkel Gain Diving and Swimming Gold Medals for U.S.; Jersey Girl Sets 400-Meter Mark She Captures Free-Style in 4:43.3 -- Webster Rallies From 6th in High Diving", The New York Times, October 18, 1964. Accessed November 1, 2018. "Bob Webster, a 25-year-old diving perfectionist from Santa Ana, Calif., and Ginny Duenkel, a free-style swimmer from West Orange, N.J., won gold medals today for the United States." ^ New Jersey Governor Charles Edison, National Governors Association. Accessed November 1, 2018. "Charles Edison, the fifty-eighth governor of New Jersey, was born in West Orange, New Jersey on August 3, 1890." ^ Pace, Eric. "Theodore M. Edison; An Illustrious Father Guided Inventor, 94", The New York Times, November 26, 1992. Accessed May 23, 2012. "Theodore M. Edison, an inventor, environmentalist and philanthropist who was the last surviving child of the inventor Thomas Alva Edison, died on Tuesday at his home in West Orange. He was 94 years old." ^ Thomas Edison National Historical Park, govnotes.com. Accessed November 5, 2007. "Half of Edison's astonishing 1,093 patents were earned during the 44 years he lived in West Orange." ^ "Capt. Marion Eppley Dies, Founded Laboratory Here", Newport Daily News, November 22, 1960. Accessed June 3, 2018. "Captain Eppley was horn in West Orange, N. J., in 1883, a son of Francis Marion and Alice Oakes Eppley." ^ "The Honorable Michael William Farrell Associate Judge District Of Columbia Court Of Appeals", District of Columbia Courts, backed up by the Internet Archive as of May 21, 2012. Accessed June 28, 2018. "Judge Michael William Farrell was appointed to the District of Columbia Court of Appeals in 1989 by President George H.W. Bush. Judge Farrell was born and raised in West Orange, New Jersey." ^ "Eugenio Fernandi, 66, famed opera tenor", Echoes-Sentinel, August 15, 1991. Accessed October 25, 2015. "Born in Pisa, Italy, Mr. Fernandi lived in West Orange before moving to Millington four years ago." ^ Knowles, Patrick. "Leo Fitzpatrick's Composed Cool", SOMA magazine, July 2006. Accessed October 25, 2015. "In fact, it would be safe to say that if he had not started cutting school to hang out in the skate spots of New York the 28-year-old might still be living in his small working-class hometown of West Orange, New Jersey." ^ Henry, Marilyn. "Rabin makes condolence call on Flatow family", The Jerusalem Post, May 10, 1995. Accessed January 17, 2011. ^ Johnson, Bonnie. "Boom or Bust, Wall Street Finds Designer Alan Flusser's Stock Is Secure", People (magazine), January 18, 1988. Accessed October 30, 2014. "As a teenager in West Orange, N.J., Flusser demonstrated his gift of garb early on." ^ Galen, Rich. "Where Were You When...", Townhall.com. Accessed October 30, 2014. "Here's my story. I was a senior at West Orange Mountain High School in West Orange, New Jersey." ^ Shabe, John. "GDP's new video is all over Essex County", NJ Advance Media, October 28, 2009. Accessed October 25, 2015. "The NJUnderground tipped me to this new video from West Orange's GDP. He's in Gainesville, Fla. tonight about two weeks into his tour, but this video, 'Orange Water', really hit home." ^ Rose, Lisa. "New Jersey native Chris Gethard to star in 'Big Lake' on Comedy Central", The Star-Ledger, August 16, 2010. Accessed January 17, 2011. ^ via Associated Press. "John J. Giblin", The New York Times, December 21, 1975. Accessed February 18, 2016. ^ Bondy, Halley. "Whoopi Goldberg moving to West Orange", The Star-Ledger, October 5, 2009. Accessed January 17, 2011. ^ Staff. "Maclyn S. Goldman", The New York Times, November 21, 1977. Accessed November 1, 2018. "Maclyn S. Goldman, a New Jersey State Senator from 1965 to 1967 and founder of the Goldman, Goldman, Caprio law firm of East Orange, N.J., died Friday in his home at 6 Spring Hill Drive in West Orange, N.J."
^ Raymond E. Goldstein, Curriculum Vitae, University of Cambridge. Accessed May 28, 2016. ^ Biography, Allan Gorman. Accessed October 21, 2015. "Allan Gorman currently maintains a studio practice in Kearny, NJ, and resides in West Orange, NJ." ^ Acts of the General Assembly of the State of New-Jersey, p. 910. I. Collins, 1873. Accessed May 27, 2016. "An Act_to change the name of Thomas Frost Haskell: Be It Enacted by the Senate and General Assembly the State of New Jersey, That the name of Thomas Frost Haskell, of the township of West Orange, in the county of Essex, be and the same is hereby changed to Llewellyn Frost Haskell... Approved January 29, 1873." ^ Lee, Eunice. "Hopping towns: former Orange mayor may run for W. Orange mayor in '14, says he's lifelong resident", The Star-Ledger, December 3, 2013. Accessed October 30, 2014. "Hawkins, 34, says he's a lifelong West Orange resident who lived in Orange for roughly seven years, including his four years as mayor." ^ Giase, Frank. "Sky Blue FC selects Maya Hayes with their first round pick in NWSL Draft", The Star-Ledger, January 17, 2014. Accessed October 30, 2014. "Hayes, from West Orange, finished her Penn State career with 71 goals and 21 assists in 89 games (80 starts) and had 17 game-winning goals." ^ McManus, Jane. "Will Hill suspended 6 games", ESPN New York, May 30, 2014. Accessed October 30, 2014. "The Giants signed Hill, a native of West Orange, New Jersey, in 2012 as a free agent." ^ Berman, Zach. "NBA Draft 2011: Kyrie Irving taken as No. 1 pick by Cleveland Cavaliers", The Star-Ledger, June 23, 2011. Accessed August 6, 2011. "Kyrie Irving, a St. Patrick alum and West Orange native, became the No. 1 pick in this year's NBA Draft when the Cleveland Cavaliers made him their franchise player." ^ Feeney, Michael J. "Saddle River home is base for Ja Rule's new MTV reality series", The Record (Bergen County), November 7, 2015. Accessed November 8, 2016. "Atkins and his wife met as teenagers growing up in Hollis, Queens, and have been together ever since. As his career took off, they moved to West Orange, and then married in 2001 and moved to Saddle River." ^ a b via Associated Press. "Space flight by Giffords's husband in doubt", CBC News, January 10, 2011. Accessed January 17, 2011. ^ Gus Keriazakos, Society for American Baseball Research.accessed June 28, 2018. ^ "Major Army Command Says Farewell to Four-Star Commander", United States Army Materiel Command press release. Accessed November 19, 2007. "Kern was raised in West Orange, NJ and graduated from West Orange High School." ^ La Gorce, Tammy. "New Jersey's Magic Moments", The New York Times, October 30, 2005. Accessed November 1, 2018. "Take Goffin and King's Pleasant Valley Sunday. Nudged by Mr. Kirshner, who lived in South Orange in the early 1960's, Mr. Emerson began: 'Jerry Goffin and Carole King, at that time a married couple, moved from Brooklyn to West Orange. They lived kind of uncomfortably in this suburban setting, with swimming pools in the backyard and barbecues. They were rock 'n' roll songwriters, after all. They also lived very near Pleasant Valley Way.'" ^ La Gorce, Tammy. "Music; No Longer the Best Soul Singer Nobody Knows", The New York Times, February 19, 2006. Accessed November 1, 2018. "After trying to find joy everywhere from Memphis to New York City, Ms. LaVette, a ragged-voiced veteran soul singer, fades out with the pronouncement: 'So I went to West Orange.'" ^ Love, Rhoda M. "Georgia Mason: Eleven Summers Alone in the Wallowas", Native Plant Society of Oregon. Accessed October 30, 2014. "Mason, whose birth name was Georgia Mavropoulos, was born in West Orange, New Jersey, on March 16, 1910, the middle of three daughters of Greek immigrants Peter and Bessie Mavropoulos." ^ Staff. "Nick Massi, Original Member of Four Seasons Pop Group", Los Angeles Times, December 30, 2000. Accessed October 30, 2014. "Nick Massi, 73, an original member of the vocal group the Four Seasons who handled bass vocals and vocal arrangements throughout the band's glory days. The longtime resident of West Orange, N.J., performed with several bands before joining Frankie Valli in a group called the Four Lovers." ^ Joshua Maurer, Tour of Duty Pages. Accessed November 30, 2016. "Born in New Jersey, he attended West Orange High School and Sarah Lawrence College, where he obtained a B.A. degree in political science and appeared in many student stage productions." ^ Staff. "McClellan House to Go In West Orange, N.J.", The Christian Science Monitor, January 6, 1938. Accessed January 17, 2011. ^ John F. McKeon, New Jersey Legislature. Accessed October 30, 2014. ^ via Associated Press. "Joseph G. Minish, Ex-New Jersey Congressman, Dies at 91", The New York Times, November 26, 2007. Accessed November 26, 2007. "Mr. Minish, a longtime West Orange resident, died at St. Barnabas Medical Center in Livingston, N.J., said Michael Brown of the Quinn-Hopping Funeral Home in Livingston." ^ Ken Murray, Just Sports Stats. Accessed June 28, 2018. ^ DeVorkin, David. "Oral Histories: Gordon Newkirk", American Institute of Physics, June 1, 1983. Accessed November 4, 2015. "DeVorkin: Dr. Newkirk, I know you were born in Orange, New Jersey on the 12th of June, 1928. But I know nothing else about your family, your early home life. Could you give me a review? Newkirk: Until I went to college, I lived in West Orange." ^ Charles W. Nichols and Adelaide B. Nichols v. Commissioner., Leagle. Accessed October 30, 2014. "During the years 1955 and 1956, petitioner's home was in West Orange, New Jersey. It had about 16 rooms, a recreation room, and a swimming pool." ^ Herzog, Laura. "Broadway baby: 'Hamilton' star returns to N.J. alma mater", NJ Advance Media for NJ.com, May 2, 2016. Accessed June 13, 2016. "Onaodowan grew up in West Orange with his parents and five sisters, and attended Gregory Elementary School, Roosevelt Middle School, and West Orange High School, graduating in 2005, school officials said." ^ Bumiller, Elisabeth. "Israeli Diplomat Is Man in Middle", The New York Times, September 17, 2012. Accessed November 19, 2012. "Raised in a conservative Jewish family in West Orange, N.J., Mr. Oren worked on a kibbutz at 15, was educated at Princeton and Columbia, immigrated to Israel and spent multiple tours in the Israeli Army, including a job as spokesman during an infamous low point for the military, its poor performance in the 2006 war in Lebanon." ^ Staff. "Frederick P. Ott, Edison Aide, Dies; Became Associated With the Inventor in 1874, Working in Small Newark Plant, Assisted In Film Work Collaborated in Development of Motion Pictures, Electric Light and Phonograph", The New York Times, October 25, 1936. Accessed June 28, 2018. "West Orange, N. J,. Oct. 24. - Frederick P. Ott, for many years an associate of Thomas A. Edison and who worked with the late inventor in the development of the electric light, the phonograph and motion pictures, died at his home here today." ^ Staff. "Q&A Spotlight: Robert Zane Pearlman", Explorer: Newsletter of the American Astronautical Society History Committee, Issue 10, March 2010, p. 16. Accessed February 24, 2011. "Hometown: West Orange, New Jersey"
^ via Associated Press. "HBO's 'Boardwalk Empire:' A Dramatic Getaway - New Series Brings Prohibition-Era Atlantic City, N.J., to Life with Historical Accuracy, Lavish Detail", CBS News, September 19, 2010. Accessed October 25, 2015. "Inevitably noted for his baby face, arresting blue eyes and pouty, pillowy lips, the 29-year-old West Orange, N.J., native seized on acting because, 'I liked the attention. And it kind of evolved into a craft, a skill, which was a positive thing in my life. Then I came to New York. I never really left.'" ^ Knox, Erin. [sports.nyhistory.org/ann-probert/ Ann Probert], New-York Historical Society. Accessed June 28, 2018. "(Golf. Born, West Orange, NJ, Dec. 31, 1938.) Ann Linen Probert grew up around the game of golf, as she lived just a short distance from the 18th hole of the Rock Springs Country Club in West Orange." ^ Staff. "Paul C. Reilly, 94, Architect and a Catholic Lay Leader", The New York Times, September 13, 1984. Accessed October 30, 2014. "Mr. Reilly, a native of New York City who later moved to West Orange, N. J., graduated from Columbia University and, early in his career, was chief designer for the former New York City architectural firm of Thomas W. Lamb." ^ Conrad, Eileen. "John Renna: He got where he is the hard way", Asbury Park Press, April 25, 1982. Accessed June 28, 2018. "By virtue of the appointment, the 61-year-old West Orange resident, a longtime political friend of Gov. Thomas H. Kean, is chairman of the HFA, the Mortgage Finance Finance Agency, the Hackensack Meadowlands Development Commission and the Office of the Ombudsman for the Institutionalized Elderly." ^ Bodley, Hal. "N.Y. Yankees Hall of Famer Phil Rizzuto dies at 89", USA Today, August 15, 2007. Accessed July 3, 2008. "Rizzuto, who would have been 90 in September, died Tuesday from pneumonia after living his last several years in declining health at a West Orange, N.J., nursing home." ^ a b Fagan, Joseph. "Romance Blossoms for Future President and First Lady in West Orange", TAP into West Orange, June 30, 2013. Accessed June 28, 2018. "Douglas Robinson Sr. and his wife Fanny Monroe Robinson came to West Orange about 1872, becoming a neighbor to General George McClellan along the ridge adjacent to Prospect Avenue.... But by 1894, Corinne Roosevelt Robinson so loved the country setting of Overlook that she persuaded Douglas to make the West Orange estate their principal residence. The Robinsons and their four children then moved to West Orange and lived here year round from 1894 to 1911." ^ Kaufman, Michael T. "Peter W. Rodino Dies at 96; Led House Inquiry on Nixon", The New York Times, May 8, 2005. Accessed November 25, 2007. "Peter W. Rodino Jr., an obscure congressman from the streets of Newark who impressed the nation by the dignity, fairness and firmness he showed as chairman of the impeachment hearings that induced Richard M. Nixon to resign as president, died yesterday at his home in West Orange, N.J.. He was 95." ^ Holson, Laura M. "The Media Business; Recording Industry Lobbyist Plans to Leave Her Position", The New York Times, January 23, 2003. Accessed November 6, 2012. "Even as a young woman growing up in West Orange, N.J., Ms. Rosen, 44, the daughter of the town's first city councilwoman, showed a taste for power-brokering." ^ Staff. "N.J. Statehouse to honor Sherry Ross", New Jersey Devils, March 22, 2010. Accessed April 11, 2011. "The resident of West Orange, NJ has covered the Stanley Cup Finals on 15 occasions, while attending the Kentucky Derby six times." ^ Skelly, Richard. "Jumpin’ Johnny Sansone bringing the blues to Red Bank", Asbury Park Press, June 30, 2017. Accessed November 21, 2017. "Harmonica player-vocalist-accordionist "Jumpin' " Johnny Sansone, a West Orange native, will be accompanied by guitarist John Fohl, who rose to prominence as an excellent ensemble lead guitarist with Dr. John's Lower 911 small group." ^ Duke, Katherine. "The Beauty of Coding", Amherst Magazine, Spring 2014. Accessed June 28, 2018. "Lyndsey Scott '06 has graced the runway for Victoria's Secret, Louis Vuitton and Fendi.... She wrote of her years as a skinny, bespectacled teen in West Orange, N.J., bullied by classmates, and of her later physical and professional development into a fashion model—a role that has undeniable perks, but in which 'many people are shocked to find out that I'm anything other than an airhead,' she wrote—'that I was a comp. sci. major and that I program iOS apps, for example.'" ^ Senate Action, New Jersey Legislative Digest, June 22, 2000. Accessed November 21, 2017. "To Be A Member Of The New Jersey Historical Commission:... Carol Selman, of West Orange." ^ Mueller, Mark. "Rutgers' oldest alumnus Walter Seward dies at 111", The Star-Ledger, September 15, 2008. Accessed January 29, 2011. "Long celebrated as the oldest Rutgers alumnus, the West Orange resident also was believed to be the most long-lived New Jerseyan and the third-oldest man in the United States, according to the Gerontology Research Group, a California organization that tracks the world's most venerable people." ^ Wilson, Judy. "Crown Heights riot — fact, fiction, and plenty of blame", New Jersey Jewish News, June 8, 2006. Accessed June 20, 2018. "Edward S. Shapiro is too skilled a historian to believe that there is one truth, but he is committed to exploring the varying narratives, examining the language of each, and skewering the biases in Crown Heights: Blacks, Jews, and the 1991 Brooklyn Riot (University Press of New England), the first and only book on the first and only anti-Jewish riot in American history.... Although he has lived in West Orange since 1969, where he and his wife, Daryl, belong to Congregation Ohr Torah and Congregation Ahawas Achim B'nai Jacob and David, cities fascinate him." ^ Ginsberg, Johanna. "Local scholar organizes conference on history of Modern Orthodoxy", New Jersey Jewish News, June 1, 2006. Accessed June 28, 2018. "A West Orange scholar is the co-organizer of the first-ever conference in America on the history of Modern Orthodoxy, to be held June 13–15 in Scranton, Pa. Marc B. Shapiro, who holds the Harry and Jeanette Weinberg Chair in Jewish Studies at the University of Scranton, said the conference will take a historical view of the movement in order to explore its meaning for today." ^ Wakin, Daniel J. "Alfredo Silipigni, 74, Who Founded an Opera Company, Dies", The New York Times, March 29, 2006. Accessed June 2, 2008. "Alfredo Silipigni, a conductor and specialist in lesser-known Italian operas who founded the New Jersey State Opera and ran it for four decades, died on Saturday in Livingston, N.J. He was 74 and lived in West Orange, N.J."
^ Dr. Eve Elizabeth Slater, National Institutes of Health. Accessed October 29, 2016. "Eve Slater was born in 1945 in West Orange, New Jersey." ^ via Associated Press. "Andy Stern of the SEIU, longtime powerful labor boss, to retire", The Star-Ledger, April 13, 2010. Accessed January 29, 2011. "Andrew Stern, president of the Service Employees International Union and a West Orange native, answers questions during an interview at his office in Washington on Thursday, Feb. 9, 2006." ^ Ackermann, Peggy. "A political fight provides N.J. Supreme Court with apolitical legal mind", The Star-Ledger, October 24, 2010. Accessed July 9, 2016. "Residence: Raised in South Orange; lived in West Orange; currently lives in Monroe, Middlesex County"
^ About Mark, MarkTrainor.com. Accessed January 17, 2011. ^ Lappin, Joan. 'Jury Finds Madoff Really Didn't Do It Alone", Forbes, March 27, 2014. Accessed October 25, 2015. "He was really Albert Vilar, not Alberto, from West Orange, New Jersey although he was born to Cuban parents." ^ Staff. "New Jersey Briefs", The New York Times, February 8, 1973. Accessed March 27, 2018. "The New Jersey chapter of the American Civil Liberties Union announced yesterday that it would ask the United States Supreme Court to stay an election of the West Orange Board of Education until the name of a 16‐year‐old high school sophomore was included on the ballot. The A.C.L.U. said it was asking the Court to stay the election, scheduled for next Tuesday, until Stephen Vittoria was allowed to run for a place on the board." ^ Barnes, Mike. "Actress Evelyn Ward Dies at 89", The Hollywood Reporter, January 11, 2013. Accessed May 28, 2016. "The glamorous, dark-haired Ward, a native of West Orange, N.J., began her career as a Roxyette at New York's famed Roxy Theatre in the early 1940s, then headed for Broadway." ^ Schmander, Sherie Fox. "Charlotte Fowler Wells" in Past and Promise: Lives of New Jersey Women, p. 207. Accessed June 28, 2018. "When it was incorporated in 1894, she became president of the new Fowler and Wells Company and from that period to her death she lived in West Orange, NJ." ^ Jordan, Chris. "Hip-hop phenomenon 'mixtapes' go mainstream", The Tennessean, March 8, 2005. Accessed November 5, 2007. "Whoo Kid, who hails from West Orange, N.J., has certainly diversified. The Queens-raised kid of Haitian parents starting spinning at 16; now, he performs around the world with 50 Cent and on his own." ^ Fizgerald's Legislative Manual, State of New Jersey, Volume 194, Part 2; Volume 195, Parts 1-2, p. 394. J. A. Fitzegerald, 1971. Accessed June 3, 2018. "Kenneth T. Wilson (Rep., West Orange) Assemblyman Wilson, the son of Mr. and Mrs. Kenneth H. Wilson, was born in Newark, on March 20, 1936, the eldest of two sons. He attended the West Orange public schools and graduated in 1954 from West Orange High School." ^ Midler, Caryn. "Scott Wolf Reveals His Secret Nickname", People (magazine), October 25, 2006. Accessed January 17, 2011. ^ Edel, Raymond A. "Mini-Bio for Kids: Ian Ziering", The Record (Bergen County), December 20, 1992. Accessed September 29, 2007. "Ian, a native of West Orange, is a graduate of William Paterson College in Wayne." ^ Staff. "Jury To Get Tax Case; Judge Holds Jersey Panel Must Pass on Zwillman Charges", The New York Times, February 28, 1956. Accessed May 23, 2012. "Federal Judge Reynier J. Wortendyke Jr. ruled today that income tax charges against Abner (Longie) Zwillman of 50 Beverly Road, West Orange, must be submitted to the jury." ^ Sullivan, Joseph F. "Jersey Man in Abscam Case Is Experienced With Inquiries; Conspiracy Charges Dismissed Two Other Directors From Jersey Started as Tire Salesman Need for Advice Questioned Bid-Rigging Indictment Message Termed Death Threat", The New York Times, March 9, 1980. Accessed November 1, 2018. "Mr. Zwillman, who later was found hanged in his West Orange home, also testified about his relationship with Mr. Bozzo." 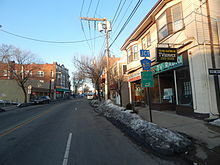 Wikimedia Commons has media related to West Orange, New Jersey.